Rich Art is greatly honored to be invited to participate in the exhibition organized and planned by GAA during Venice Biennale 2017. 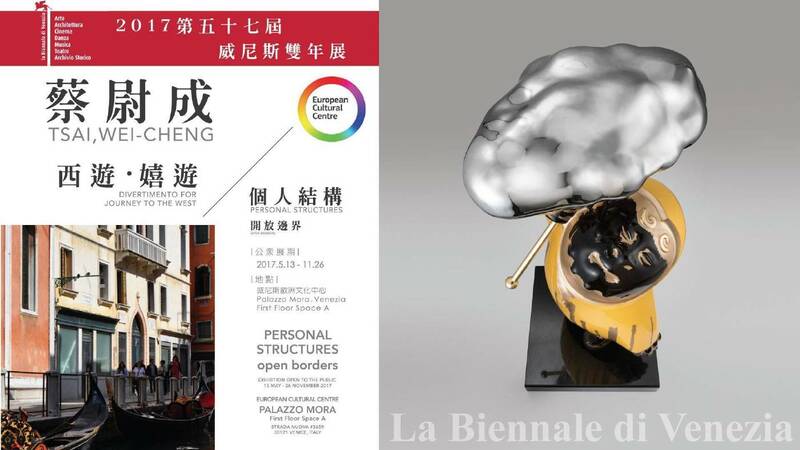 They are especially pleased to invite Tsai-Wei-Cheng to attend the exhibition, which is one of the three major exhibitions in the word and it's also the most prestigious Venice Exhibition. Tsai Wei-Cheng will bring his artwork 『Iron King Kong- Wearing the courage ,you can be invincible.』 the first time he sets foot in the city which encourages people to take action to pursue their ideals. The exhibition is named "Journey to the West " curated by the curator Dr. Ｗoan-Jen Hsu, She conveys Tsai Wei-Cheng’s works in a brisk, easy to understand and a humorous way. She profoundly conveys the ancient history of the universe from the cosmological side and outlook on life to the West., in accordance to GAA's theme "time, space, existence" which is meant to evoke the relationship between the environment and people and inspire further discussion and thinking. Global Art Affairs Foundation: The GAA Foundation is a nonprofit organization that is registered and organized entirely by artists in the Netherlands. The aim of GAA is to enhance the world's awakening, the understanding of art ,and art related matters. To explore these topics more deeply from a philosophical perspective through the various themes of art, architecture and culture. The foundation was started in 2005,GAA has been using the subject of time, space, existence to invite artists, architects and people from all over the world to contemplate it. through its European Cultural Center during the Venice Biennale period. At present, GAA has four official exhibitions in Venice: Palazzo Mora, Palazzo Bembo, Palazzo Michiel and Palazzo Rossini. This time,Tsai wei-cheng’s exhibition will be held at the Palazzo Mora.We welcome you to visit the exhibition. Cultural interaction between the East and the West has been going on for a very long time. As early as the 3rd year of Zhenguan in the Tang dynasty (AD629), there was Xuanzang the Buddhist monk going west to seek dharma. Xuanzang exited the border from Liangzhou, going through countries in Western Regions, climbing over the Pamir mountains, and eventually arriving in Tianzhu (now India). It took him 16 years to return to Chang’an, the capital of Tang dynasty (AD645). Afterward, Xuanzang translated 75 Buddhist sutras into 1,335 volumes, and he is regarded as the greatest Buddhist sutra translator in Zhongyuan (the central plain of China). These translated Buddhist sutras were subsequently spread to the Korean Peninsula, Japan, Vietnam, and other places through the diplomatic envoys sent to China by other countries, and the translations had a far-reaching impact on the religions, cultures, and arts of the Eastern countries. Great Tang Records on the Western Regions, narrated by Xuanzang and written by his disciple Bianji, not only became the prototype of the later novel Journey to the West but also provided precious information for historical and geographical research to both the East and the West. Journey to the West, written in the middle of the 16th century, combined the thoughts of Confucianism, Buddhism, and Taoism and is very popular around the world, having been translated into multiple languages. Its storyline, widely known among Taiwan households, mainly describes 81 disasters that a Tang monk and his disciples went through. The Tang monk, inspired by and modeled after Xuanzang, is the protagonist of the novel on the surface, but the focus of the whole storyline is gathered around his most senior disciple, Sun Wukong. 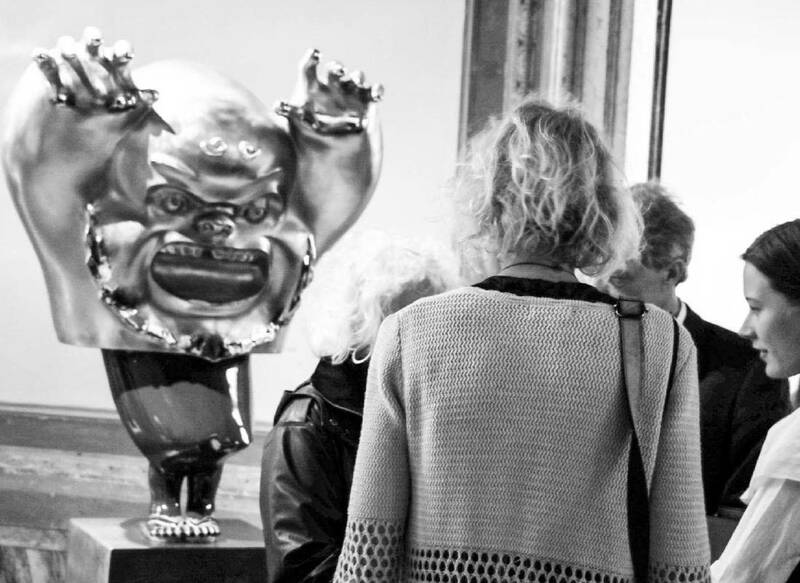 Today, approximately 500 years after the completion of Journey to the West, Taiwanese artist Tsai Wei-Cheng is bringing Sun Wukong west (Venice) again with his 72 Series of sculptural work, a series that has great cross-cultural significance. According to description of Journey to the West, when Nüwa mended the heavens, she left behind a magic stone. That stone absorbed the natural essences of the sun and the moon, and a monkey later burst out of the stone. Taoist patriarch Bodhi taught that monkey the 72 polymorphic transformations, told it how to summon the somersault cloud, and christened it Sun Wukong. Ruyi Jingu Bang, its weapon, was forcibly obtained from Ao Kuang, the dragon king of the Eastern seas, after Sun Wukong created a mess in the Dragon Palace. The magical headband the monkey wore is the Buddhist instrument that the Tang monk used to contain Sun Wukong by reading spells. In the 72 Series created by Tsai Wei-Cheng, the magical headband of Sun Wukong represents tangible and intangible norms, the somersault cloud that allowed Sun Wukong to go everywhere freely represents unfettered dreams, Ruyi Jingu Bang—the size of which can be enlarged and reduced at will—represents flexible power, and the child-like image of Sun Wukong represents the pure and clear inner self. This immutability of the absolute of the inner self reflects the eternal truth of the ever-changing things in this ever-changing world, namely the fundamental postulate is the great primal beginning of all that exists. That statement is what the I Ching would describe as “There is in the changes the great primal beginning. Taiji generates the two primary forces. The two primary forces generate the four images. The four images generate the eight trigrams”. Taiji is the root of the formation of the universe, driving the earth to rotate. Yin and yang, change and static, are both inter-restricting and yet inter-promoting, interrelated and becoming a unified body. Tsai Wei-Cheng is bringing his 72 series to Venice and allowing Sun Wukong of Journey to the West to go west again. This trip to the west is no longer about retrieving Buddhist sutras but taking Eastern philosophy to the Western world. Deep kiss has the sweet poetic feel of immersive love. Iron King Kong is the self-dialogue of self-proclamation and self-encouragement; fear does not come from external sources but from inside the heart. The artwork"To Change the fate" describes the circumstances of life that are ever-changing, and change is the eternal truth of life. Tsai Wei-Cheng uses this contemporary art language to compose this divertimento about Sun Wukong going west. The series is brisk, simple, and humorous, yet it profoundly conveys the concept of the universe and life throughout the long history of the Orient. 81 is the square of 9, the biggest among single-digit numbers, and in the East, it is a metaphor for a very large number that is close to infinite.